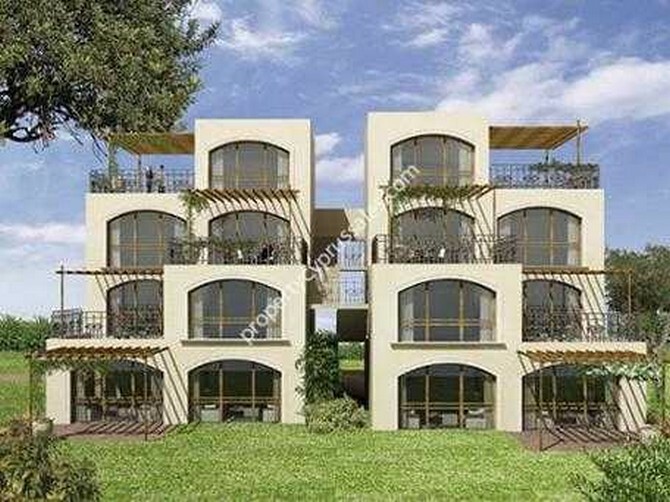 Pre 74 Turkish Title Deed, 2 bedroom First Floor beachfront penthouses in North Cyprus Guzelyurt part of an estate of 120 apartments strategically located to absorb the Mediterranean Sea views to the west and the famous Cyprus Troodos Mountains to the south. At Guzelyurt Beachfront Village properties you will find amenities offering luxury and convenience.2 bedroom apartments start from GBP 41,900 and 3 bedroom apartments start from GBP 55,000. Current availability (15 Nov) GBP 56,950 garden apartments (4 remaining) and penthouses GBP 81,950 (5 remaining). There is a promotion on from March 2007 - please see the attached price list..The 3 bedroom 100 sqm Garden North Cyprus apartment and the 2 bedroom 80 sqm Terrace apartment will benefit from a large private terrace with a pergola overlooking the azure sea. The uniquely designed 80 sqm 2 bedroom duplex penthouse offers 2 private terraces, one on each level with non-disturbed panoramic view of the azure sea and the Troodos Mountains. DistancesBeach - Onsite Guzelyurt Shopping Center - 4 minutesNorth Cyprus Golf Course - 4 minutes Nicosia - 30 minutes Kyrenia Riviera - 30 minutesErcan Airport - 40 minutes Larnaca Airport - 75 minutes Paphos Airport - 75 minutes University of Lefke - 10 minutes Middle East Technical University - 10 minutes Facilities includeTerrace BarGrill RestaurantSunset Cafe-BarWellness and Fitness CenterSemi-Olympic Overflow Swimming PoolChildren?s Pool JacuzziSaunaMassage RoomVolleyball, Tennis Court, and Indoor GymThese features of the Northern Cyprus villas truly ensure the high-culture touch for holiday goers and investors in TRNC alike. Pre 74 Turkish Title Deed, 2 bedroom First Floor beachfront penthouses in North Cyprus Guzelyurt part of an estate of 120 apartments strategically located to absorb the Mediterranean Sea views to the west and the famous Cyprus Troodos Mountains to the south. At Guzelyurt Beachfront Village properties you will find amenities offering luxury and convenience. 2 bedroom apartments start from GBP 41,900 and 3 bedroom apartments start from GBP 55,000. Current availability (15 Nov) GBP 56,950 garden apartments (4 remaining) and penthouses GBP 81,950 (5 remaining). There is a promotion on from March 2007 - please see the attached price list.. The 3 bedroom 100 sqm Garden North Cyprus apartment and the 2 bedroom 80 sqm Terrace apartment will benefit from a large private terrace with a pergola overlooking the azure sea. The uniquely designed 80 sqm 2 bedroom duplex penthouse offers 2 private terraces, one on each level with non-disturbed panoramic view of the azure sea and the Troodos Mountains. These features of the Northern Cyprus villas truly ensure the high-culture touch for holiday goers and investors in TRNC alike.